Site of this morning's crash of the plane carrying the Polish President and his wife, and high ranking members of Poland's society. They were traveling to commemorate the 70th anniversary of the Katyn massacre of some 20,000 Polish officers by Stalin's secret police, when their plane crashed in the fog outside the town of Pechorsk, in Russia's western Smolensk region. Katyn is near Russia's border with Belarus. Hmmm.... Highly unusual. The thought occured to me, that if it hadn't have been for the ego between the governments of Poland and Belarus, Kaczyński's pilot might not have refused landing in Minsk, and the Polish government members would still be alive. But I'm also suspicious. This crash could be very beneficial to the governments of Belarus and Russia. And, it's no secret that Kaczyński, former mayor of Warsaw, was a an anti-gay bigot who contributed to the misery and isolation of Poland's LGBT community. Nevertheless, I'm sorry for the grief of their family members, for the Polish people, and for the good people who were aboard the plane, and I hope it turns out that this tragedy has a good side to it. ~M.R. 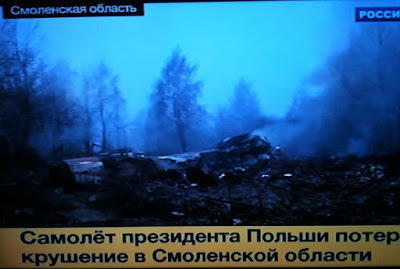 About 100 persons including the President of Poland Lech Kaczyński and his wife were on the plane Tu-154 which crashed in Smolensk oblast. “Interfax” was informed about that by the spokesperson of the Russian Prosecutor General's Investigations Committee. 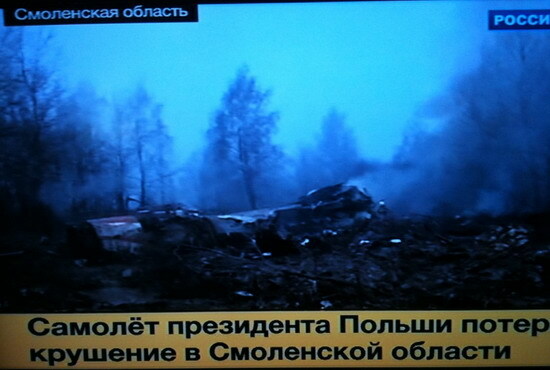 "President Kaczynski's Tu-154 airplane crashed when landing near the town of Pechorsk, Smolensk region, in heavy fog. There were 132 people on board the plane, including the president and his spouse."